You are currently browsing the archives for the tag 'anniversary'. 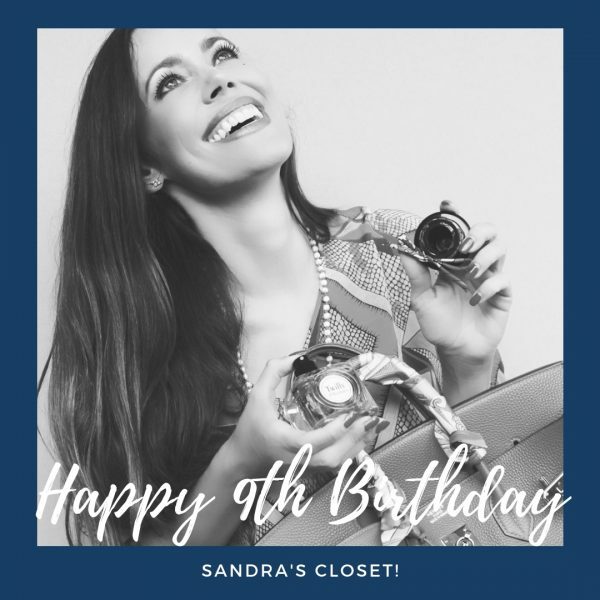 Happy 9th Birthday, Sandra’s Closet! 9 years – as crazy as it sounds but I have been blogging now for 108 months, which is around 3285 days, and this is my 3829th post which means I wrote more than one per day. I am thankful, Sandra’s Closet has taken me on the craziest, busiest but most amazing ride in my life. Yesterday at the LA MER counter event at Jelmoli, I was so proud to welcome some of my Swiss readers, confident, beautiful and smart women, who came from all over the country. I cannot wait to show you the photos. A huge thank you to everyone for coming and the little surprises, I truly felt loved. 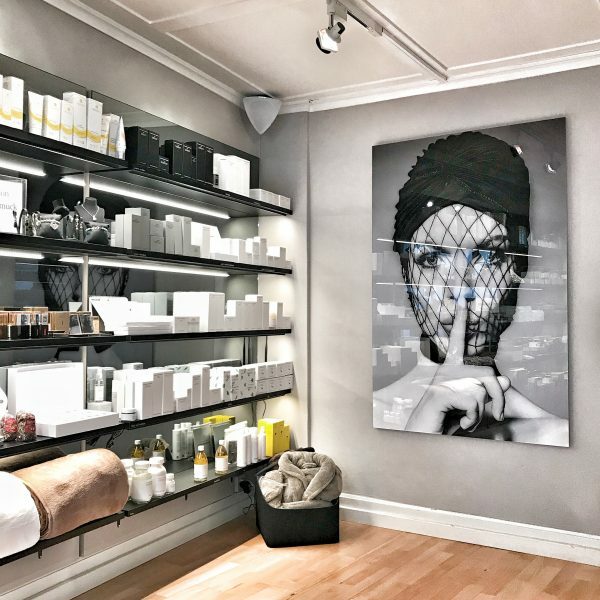 Today, I am celebrating my blog anniversary by treating myself to an Ayurvedic massage by Ramji Lal at Beauty Care Zurich (Strehlgasse 29, 8000 Zürich, Phone: +41 44 212 12 77). Just as a machine needs to be oiled, the body loves to have its largest organ, the skin, soothed. Anyone who has ever experienced an Ayurvedic treatment, knows its rejuvenating effect. It treats not only the body, but also the nervous system, bringing deep nourishment to all the cells and tissues as well as the mind. As I am pretty exhausted at the moment due to all my travels and projects, it helps me to recharge my energy levels. Ramji Lal has magic hands and he learnt the 5000-year-old techniques from his mother when he was a little boy. His family produces Ayurvedic oils from home-grown herbs and plants in India’s holy city. Later, he trained at the prestigious Dr. med. Franklin’s Panchakarma Institute in Kerala. Feels like heaven: an Ayurvedic massage by Ramji Lal. 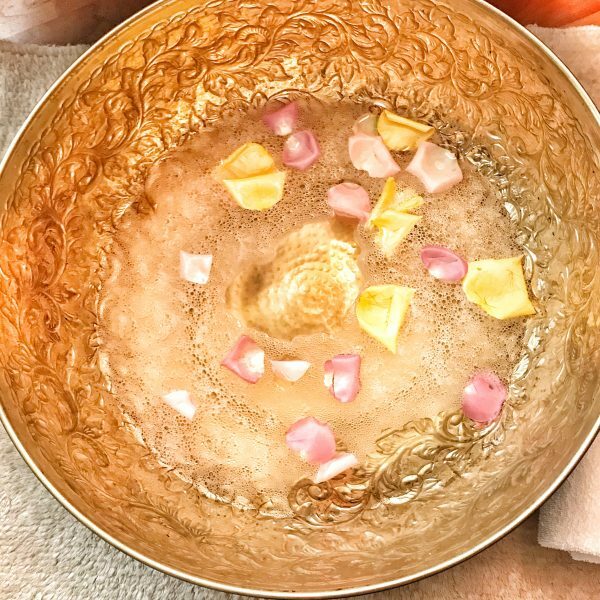 An Ayurvedic massage is MOST beneficial when combined with an Ayurvedic lifestyle, which means making conscious choices about your nutrition, sleep and more. Ramji for example suggested that I drink a glass of warm water in the morning with one teaspoon of turmeric and one of cumin which has a detoxifying, energy-boosting and fat burning effect. Have a lovely weekend! And stay tuned… today I am treating myself, during the coming days you will be treated to celebrate the 9 years of Sandra’s Closet! Happy 8th Birthday, Sandra’s Closet! 8 years – as crazy as it sounds but I have been blogging now for 96 months, which is around 2920 days, and this is my 3464th post which means I wrote more than one per day. I am thankful, Sandra’s Closet has taken me on the craziest, busiest but most amazing ride in my life. I was one of the first ones when I started in 2009 with this post about the Birking bag by Hermès. Many friends were laughing at me and I had to convince so many press offices about what I was doing. In the end I was right. Today, bloggers and so-called influencers have taken over the media world and many of those brands that were completely against it are trying to get on the train they have been missing before. Print is struggling and media budgets focus on digital. What I am missing sometimes is the reason why blogging originally started, it was about passion, being able to write about young designers or products that didn’t have a big advertising budget yet and to show what you truly love. Of course, you have to earn money but the fine line between monetization and truly felt passion seems to often fade away. Today, I feel it is more about getting free products and becoming famous on Instagram. Personally speaking, I don’t want to say I am a blogger or influencer anymore, those titles come with a negative connotation and honestly I don’t want to influence other people, I would like to inspire them and hope that you still feel my passion in every day ‘s post. To the next 8 years of blogging, or let me say inspiring you! Happy 7th Birthday, Sandra’s Closet! 7 years – as crazy as it sounds but I have been blogging now for 84 months, which is around 2555 days, and this is my 3098th posts which means I wrote more than one per day. I am thankful, Sandra’s Closet has taken me on the craziest, busiest but most amazing ride in my life. Blogging is what I love to do most. I am independent, I can write whatever or wherever I am. It gives me so much freedom and joy. I love to do my collages and it has never ever been something I had to force myself to do. 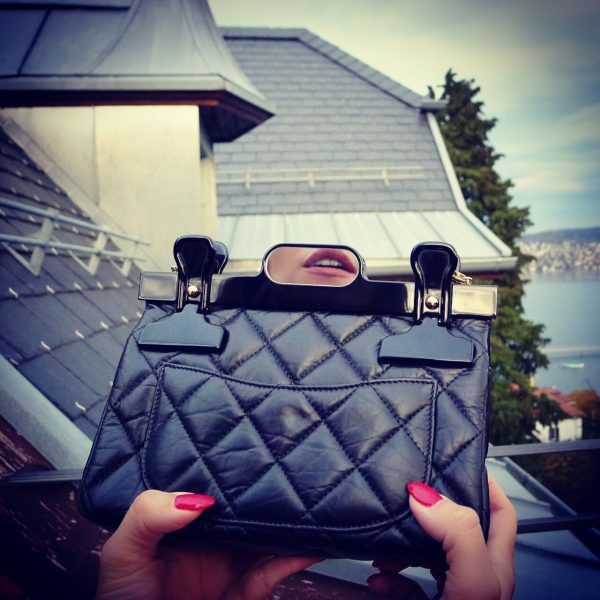 To honour the occasion, I gifted myself with this new Chanel 2.55 bag from the «Front Row Only» collection. I think the attached hanger and the built-in hidden mirror on the back is too cute and it couldn’t be a better match to celebrate my closet. As everything wouldn’t be possible without you, my dear readers, who have supported me over the last years, I have a gift for you, too. Please enjoy this special early access code BFLSU30 with 30% off on full priced orders over £300/€300 at LUISAVIAROMA. Thank you from all my heart for your comments, your mails. With some of you I have even developed a relationship over the past years. I will continue to entertain you with your daily dose of fashion, beauty and lifestyle. Recently, I have been thinking about doing a relaunch of my blog, a new layout for example but on the other side, I am loving my design, it looks different from others and I find it easy to navigate. Please shoot me an e-mail what you would change or if you prefer it the way it is to . 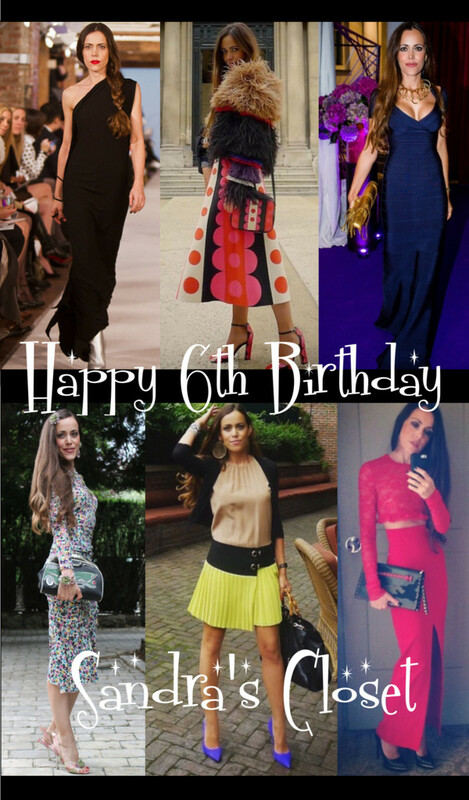 Happy 6th Birthday, Sandra’s Closet! Can you imagine that Sandra’s Closet is turning 6 today?! This is my 2766th posts – I still cannot believe the amazing journey I went on for the last six years as a blogger. Fashionable encounters, exciting moments, traveling the world, I met so many interesting people, celebrities and fashion designers and I truly enjoyed every single bit of it! Therefore I would like to thank all of you who follow my adventures – without you, my dear subscribers and avid readers, this wouldn’t have been possible. Parallel to the launch of my blog in 2009, SI Style Magazine featured me on six pages which was the perfect kick off for Sandra’s Closet! To many more years and posts to come! Happy 4th Birthday, Sandra’s Closet! Yesterday, four years ago, the probably biggest adventure of my life has started, I published my first post and Sandra’s Closet was born. I am so grateful for all the amazing things that have happened since then. My blog has taken me on such a beautiful adventure and I would like to thank you all for following me and supporting my work. Without you, the success wouldn’t have been possible. As you know, I have taken another challenge that I am very happy about. 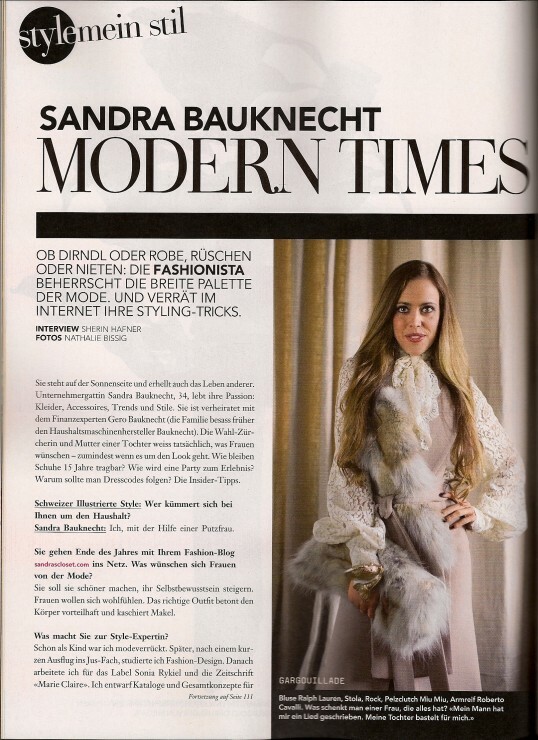 I am the editor-in-chief of L’Officiel Switzerland and really enjoy working along my great team. Therefore, I am having another exciting year in front of me and you will get – of course – the essence of it through Sandra’s Closet. If you get a chance, check out my new photo section where I uploaded some of the celebrities I have met during the last four years… and can you imagine that this is the 2040th post I have published?! 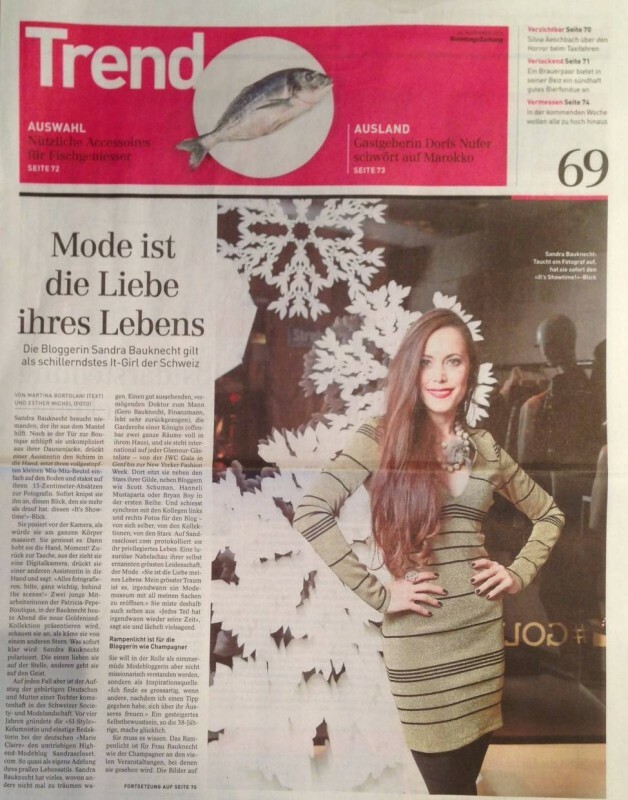 A huge thank you to Martina Bortalani for the portrait in today’s Sonntagszeitung! 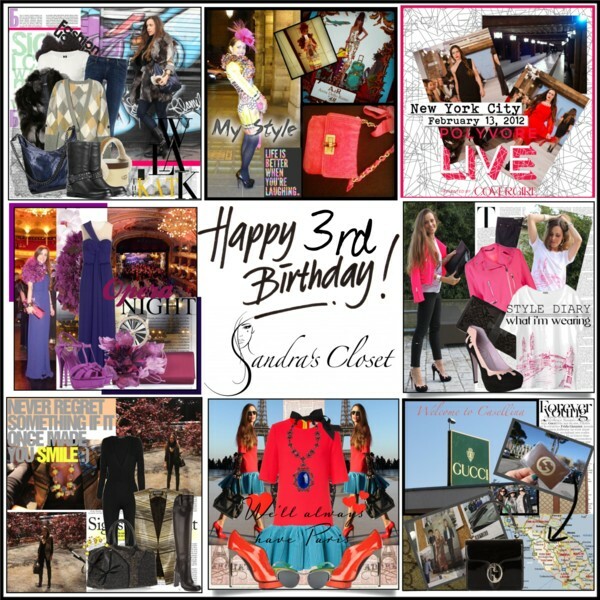 Happy 3rd Birthday, Sandra’s Closet! Today, three years ago, I published my first post and Sandra’s Closet was born. My blog has taken me on such a beautiful adventure. I would like to thank you all for following me and supporting my work. Without you, the success wouldn’t have been possible. Below are some press features of me during Paris Fashion Week that I have meant to show since a pretty long time. Enjoy! Featured in Marie Claire: Me in Mary Katrantou’s beautiful Ivory dress. 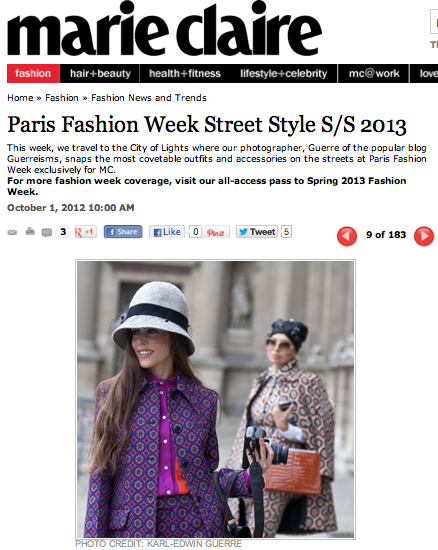 Featured in Marie Claire: Me at the last day of Paris Fashion Week. This look was also seen in Harper’s Bazaar. 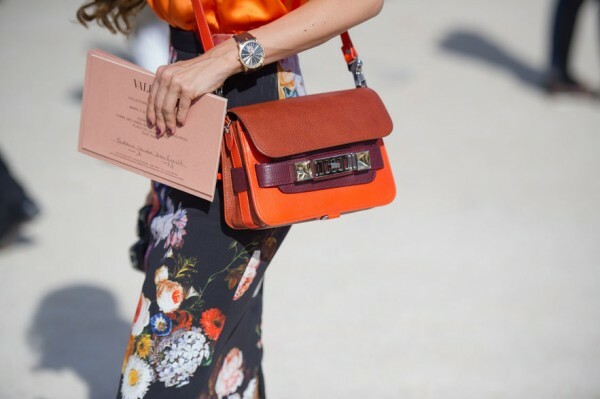 French Vogue showed some details of my look that I wore to the Valentino S/S 2013 show. 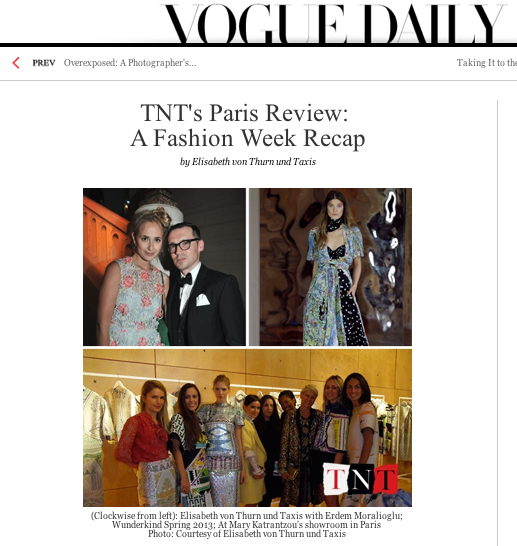 Elisabeth von Thurn und Taxis wrote in her column for American Vogue about our fun trip to Mary Katrantzou’s showroom (all the details to be posted soon). The gang: Eugenie Niarchos, Sandra Bauknecht, Elena Perminova, Miroslava Duma, Mary Katrantzou, Tamu McPherson, Elisa Nalin, Elisabeth von Thurn und Taxis and Viviana Volpicella. 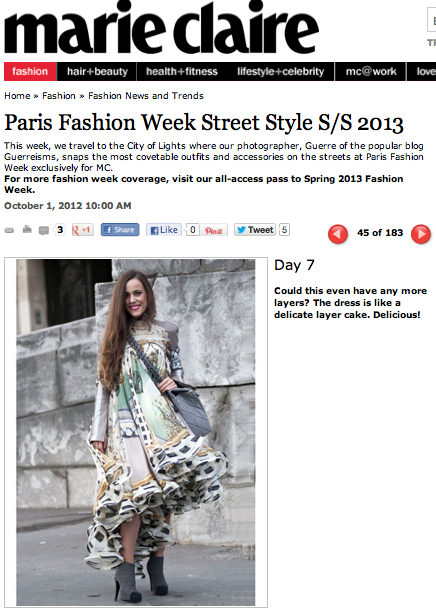 Featured on Treetslook at the Stella McCartney S/S 2013 show. OMG! On Fausto Puglisi’s website, I am featured among celebrities such as Beyoncé, Katy Perry and Madonna. Scroll through! This weekend, I will publish some amazing contests. Please stay tuned to find out more about the great prizes that you can win during the next two days. Happy 2nd Birthday, Sandra’s Closet! 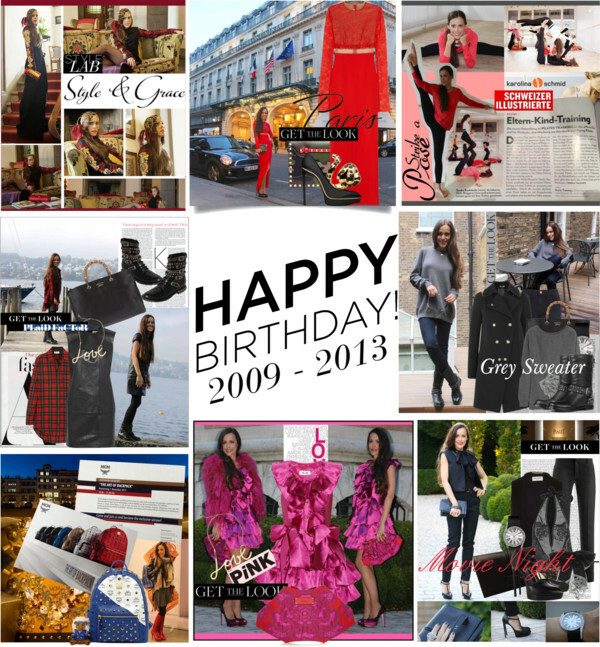 Today Sandra’s Closet celebrates its 2nd birthday! The last two years were filled with fashionable adventures and exciting moments. I truly enjoyed every single day! Thank you to all of you who are reading Sandra’s Closet on a daily basis. It means so much to me. Without you, my dear subscribers and avid readers in over 140 countries, the success wouldn’t have been possible. This is my 775th post! And many more to come… stay tuned for some more giveaways to be posted soon!